For the past few decades, Batman’s characteristics have been well defined. He’s very intelligent, stoic and nearly unbeatable in hand-to-hand combat. However, there have been times when his characteristics have been broken. This mostly happens when Bruce Wayne’s Batman becomes other DC Comics characters. 7 Times Batman Has Been Other Heroes or Villains. 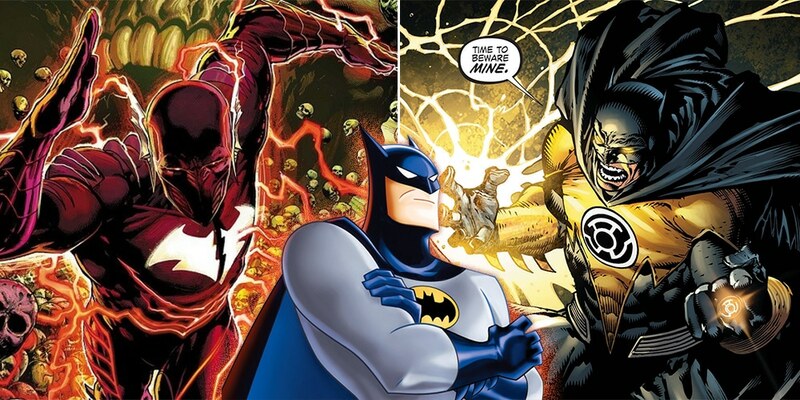 This is when Bruce Wayne meets Barry Allen. This is costume which might be possible, now that we already have Justice League on the big screen. This would be an extremely cool attempt and if you haven’t heard about the character yet and wondering about his villainous origins, it’s because he has lost too many Robins in his pursuit to fight against crime. Also Read: Did The Flash Just Reveal Its Next Big Villain? This version of Bruce believes in killing people unlike the original Batman and in one of the scenes when Flash denies him, Speed Force, he knocks him out and merges into one being. He’s not a good guy and this could be a cool thing to watch on screen. Batman has become The Green Lantern a couple of times. However, the most notable one came in Elseworlds tale. In Batman: The Darkest Knight, Bruce Wayne becomes the Green Lantern, instead of Hal Jordan. Bruce desperately wants to fight crime, begs for a sign which comes in the form of a crashed alien vessel. Here, an injured Abin Sur gives his Power Ring to Bruce. Batman & Demon, a lesson Elseworlds comic saw Bruce Wayne sharing his body with Etrigan the Demon. Because the two are bound, Etrigan takes over at night and becomes Gotham’s murderous vigilante. However, thanks to Bruce’s virtuous nature, Etrigan only targets the worst of villains. Bruce wakes up with no recollection of his adventures and knows nothing about the demon inside him. This tale sees Alfred secretly being the wizard Merlin who watches over Bruce. DC’s Dark Multiverse saw many evil versions of Batman but nothing is as villainous as The Batman who Laughs. He’s Batman in the Joker form. A hint of Bruce’s sanity still rests within The Batman Who Laughs, but Joker takes over. The followed a murderous rampage on the Joker’s part. Batman subdued him eventually, but not before Joker toxin begins infecting Gotham, driving them to madness. He even ended up murdering many Bat-family members. Batman wears the White Lantern Ring and becomes the most powerful being on the entire planet. White Lanterns are capable enough to bring the dead back to life and this makes this version of Batman one of the most powerful beings in the universe. The ring rejects Batman instantly, because he is not the true successor to the power. The Dark Knight only wears the ring for a few moments, but receives a stunning white suit redesign, which resembles the White Lantern Corps. A version of Batman who injects with a Doomsday virus to battle Superman. The Devastator originates from the Dark DC Multiverse and resides on Earth-1. His desire to bring Superman’s end lies in Man of Steel becoming a murdering madman, who even kills Lois Lane. While Doomsday virus turns Batman into a villainous being and ensures the victory of Superman. But this virus doesn’t affect only Batman but the whole city which gets infected with the virus. The Merciless is the Batman of Dark Multiverse. It’s a dangerous war machine of a man. This version begins as a hero, fighting alongside Wonder Woman to defeat God of War, Ares. Ares’ helm harbours much more power, which Batman removes during combat and dons after believing that Wonder Woman is killed by Ares. Batman turns to villainy once he dons the helm. He kills Ares and soon gets corrupted by the dominance given to him by the helm.